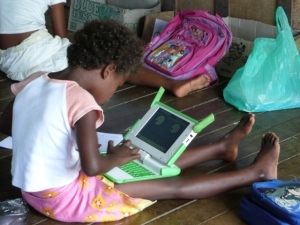 OLPC Oceania: Encouraging impressions from the field in Solomons pilots. Encouraging impressions from the field in Solomons pilots. Laura Hosman is an American researcher who has been travelling through Melanesia visiting our OLPC pilot projects in PNG and the Solomons. She has been keeping a fascinating diary of her impressions at her blog, ICT4D Views from the Field. Her latest entry covers her visit to the village of Batuna, in Marovo lagoon, Solomon Islands. "It was a special day in Batuna, because the sixth graders were taking the national exam. This meant that classes were not as they would be on a normal school day, so the teachers gathered the students who had their laptops, invited them in to the same room, and had them demonstrate the various programs they could use on the laptops. And there were many that I had not seen before! "I asked each student what their favorite program was and I received numerous answers: Paint, Chat, Memory, Writing, Photo/Camera, Connect, Maze, and Slideshow (with Paint receiving the most votes by far). The students seemed very at ease with working together over the computers–in other words, they could chat, or play a game with another student sitting across the room. I hadn’t witnessed this activity, certainly to this extent, before." "...the presence of Elnah Tati, who, in addition to teaching business computing at the college, is the IT expert at the college and for the OLPC program. She therefore also helps the primary school with teacher training and creative ideas for using the XOs. The programs and software being used on the XOs at Batuna were more diverse and advanced than I had witnessed elsewhere up to that point—which I believe was a reflection of Elnah’s involvement."